To confirm that the Cre recombinase from the registry works properly in E.coli, we co-transformed the Cre recombinase under the control of lacI regulated promoter and the confirmation device we constructed in the basic work. We picked the single colonies for inoculation overnight in Luria Broth containing chloramphenicol, ampicillin and IPTG inducer and observed the culture’s color. The result below showed that only co-transformed bacteria were red(Fig.1). So the Cre recombinase can work in E.coli. We utilized the riboregulator to reduce the leakage of our input module, so we replaced the coding sequence of Cre protein with the coding sequence of mCherry protein in the input module to detect the efficiency of this riboregulator by fluorescence intensity. We chose the device expressing the mCherry under the control of lac promoter as the positive control. Those devices (Fig. 2) are respectively transformed into BL21(DE3) competent cell. Add IPTG solution to induce in concentration of 0, and 0.1mM. Set 12 copies for each concentration and devices as repetitions. Cultivate in the 37°C shaking incubator at the rotational speed of 180 rpm/min for 4 hours. The result from the multifunctional microplate revealed that under the non-induced condition, the leakage of the input device with riboregulator is much less than that of the positive control. And the riboregulator can be activated by IPTG. We co-transformed the input module which has the Lac promoter and the confirmation device into the BL21(DE3)(Fig. 4). And we incubated 3 different colonies numbered 1, 2, 3 in 3 tubes of LB broth respectively at 37 Celsius degree for 8 hours. After that, we inoculated them into M9 medium and divided them into A group and B group. Then add 0.1ul IPTG to all A group tubes (1A, 2A, 3A) while add nothing to all B group tubes (1B, 2B, 3B). After cultivating the cells in the 37°C shaking incubator at the rotational speed of 180 rpm/min for 4 hours, we measured the fluorescent intensity using the multifunctional microplate reader(Fig. 5). As shown above, even though the addition of riboregulator did reduce a little of the expression of Cre protein, the difference between control group and experimental group was still very small which means that the riboregulator can hardly exert some critical influence on the control of the expression of cre gene. In summary, the riboregulator can reduce the leakage of the Cre recombinase. We infer that there are two reasons to cause the input module out of control. The basal expression of Lac promoter is still too high, and the Cre recombinase is efficient. However, if you want to achieve the tight control of Cre recombinase, the conjugation between the bacteria can be considered. Because the recombination has an extremely low probability without the Cre recombinase, depended on the result we got from the lox71 work. We design our output module in two plans. One is the fluorescent protein with the fast degradation tag. And the other is the RNA aptamer. 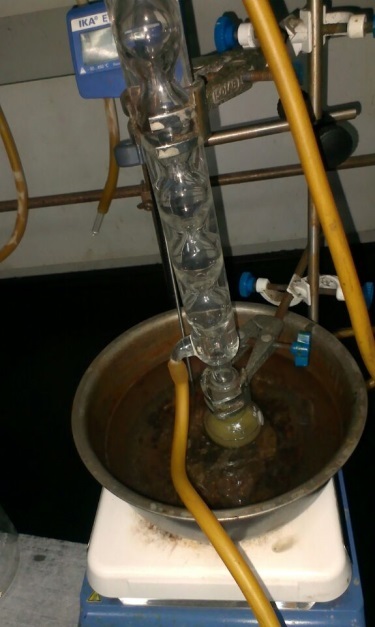 We tried our best to synthesis the fluorophore (DMHBI) during the summer. At last, it was synthesized but its purity cannot meet the experimental requirement. (Fig. 6) Finally, we turned to the senior in HUST and he helped us to synthesis it. We prepared the sample as mentioned in previous paper(Paige et al., 2011). 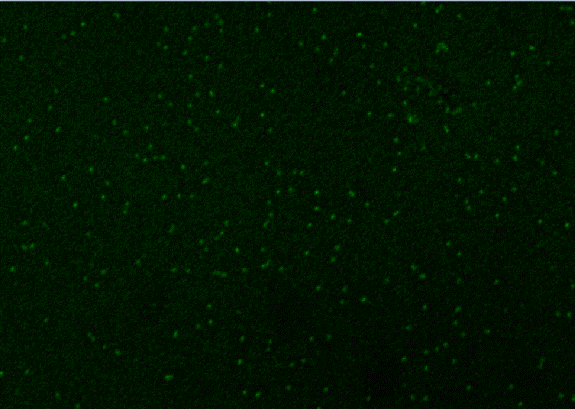 Then we tested the spinach RNA aptamer in the Tanon 1600R Gel Imaging System under the 302nm, the control groups are the DMHBI and DMHBI + control RNA. 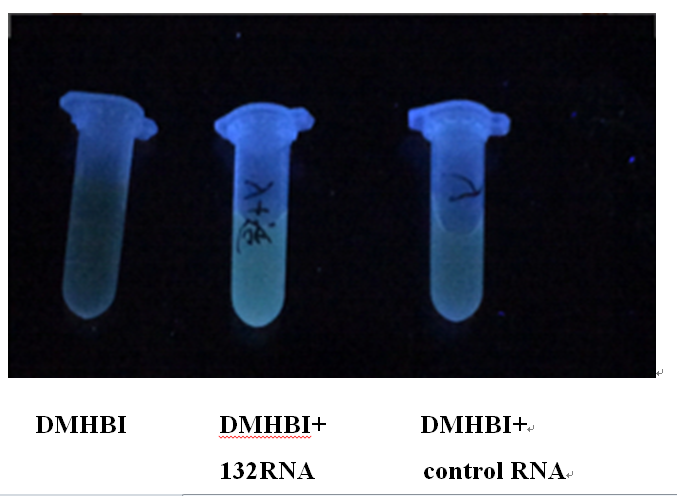 The result is below (Figure 7) and we also observed the spinach RNA aptamer by the fluorescence microscope, the result is in the Fig. 8. Figure 7. photographed under illumination with 302 nm of light. We observed fluorescence created by the output device (Fig.9) from the fluorescence microscope. 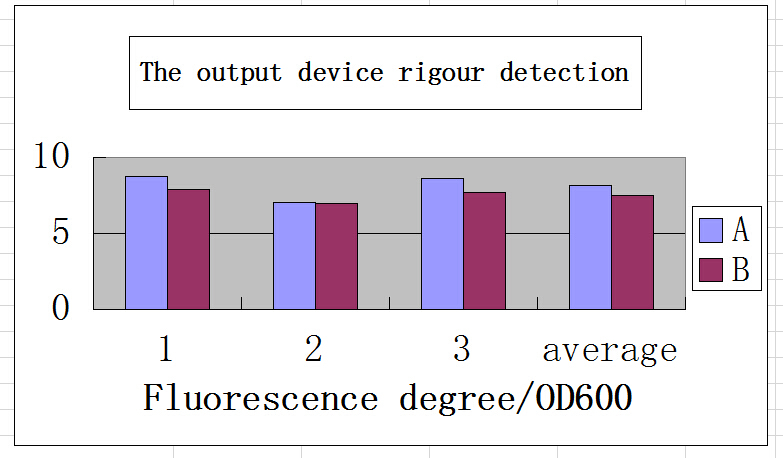 The results indicated that the output device worked as expected (Fig. 10). We completed the device which is related to quorum sensing to perform the change from positive feedback to negative feedback. The processing & output module and input module (Fig. 11) were co-transformed into the DH5α strain as experimental group and only the processing & output module was transformed into the DH5α strain as control. Cultivate in the 37°C shaking incubator at the rotational speed of 180 rpm/min overnight. Add or not add the inducer to the experiment group and control group as the Fig. 12 (a: the control. b, the control with 100nM AHL. 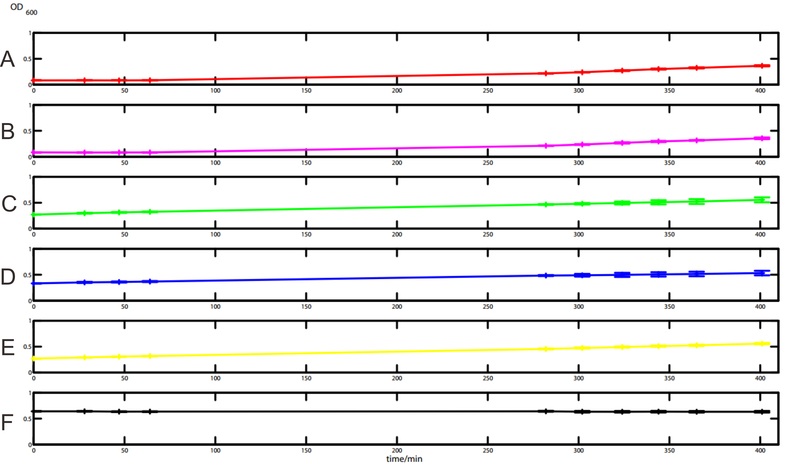 c: the experiment group without IPTG inducer. d: the experiment group with 100uM IPTG inducer. e :the experiment group with 100uM IPTG inducer after growing to mid-log. f: the control growing to stable phase.). Shaker for 3 h or 5h then cells were plated in triplicate in a 96-well BD-Falcon plate. The optical density at 600 nm and fluorescence (X excitation = 475 nm and X emission = 515 nm) were measured using a Perkin-Elmer plate reader every 15 or 20 minutes. And the result of growth curve is shown in the Fig. 12. The experiment indicated whether it was induced by IPTG had no difference, the reason was mentioned in the tight regulation test to input module. 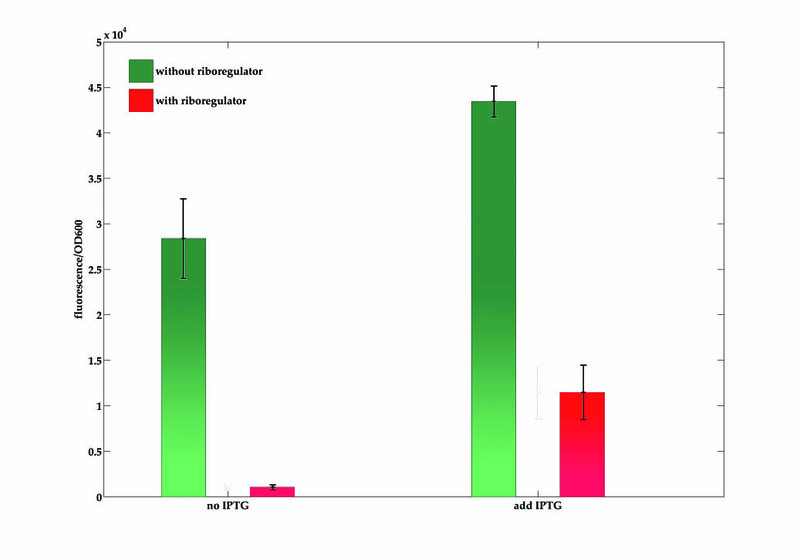 And we also found the experiment groups grow better than the control with only processing plasmid (Fig. 12). It may be that the positive feedback circle causes more over-loading, the negative feedback on the contrast. So we chose the data to analyze when all groups of the E.coli grow to mid-log, the result is below. (Fig. 13). 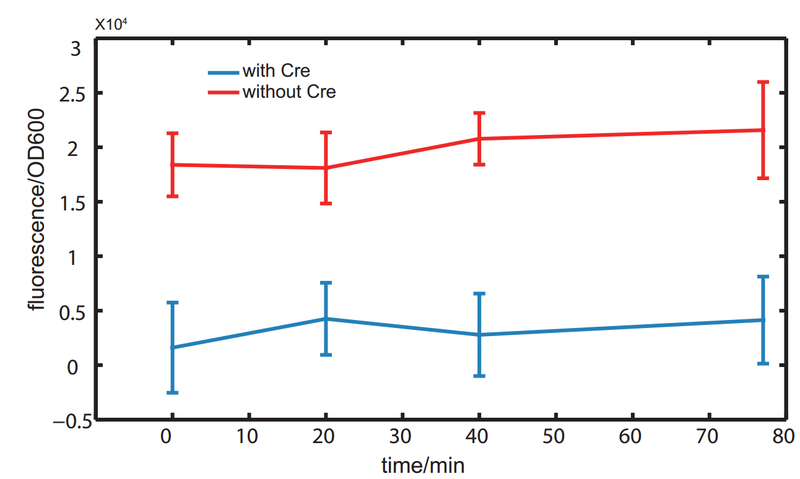 The fluorescence intensity of the group without Cre is much higher than the group with Cre. So it suggested that the circuits in experimental group have already been rewired to perform the negative feedback function. PPaige J S, Wu K Y, Jaffrey S R. RNA mimics of green fluorescent protein[J]. Science, 2011, 333(6042): 642-646.